On August 15 Human Rights Watch (HRW) accused the Russian Federation of having used cluster bombs in the conflict with Georgia. These accusations were widely repeated in the 'western' media. The Russian Federation consistently denied any use of cluster ammunition. As it now turns out the repeated HRW accusations were wrong. The 'evidence' provided by HRW was based on pictures and misidentified ammunition in those. The ammunition in question is of Israeli origin and was used by the Georgian military. The Georgian Ministry of Defense has now admitted as much. HRW now also acknowledges this in a new press statement. But it continues to claim Russian use of such weapons. It does so by pointing to its own older reports which clearly misidentified Georgian cluster ammunition as Russian made. HRW has still to show any proof for its continuing accusations against the Russian Federation. While reviewing the story as documented below, notice the special role of HRW's 'senior military analyst' Marc Garlasco in this propaganda effort. 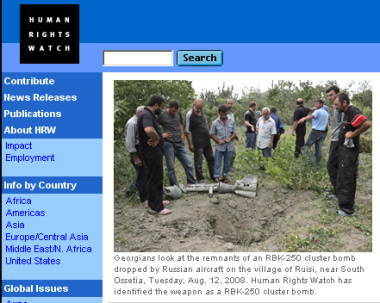 Human Rights Watch said Russian aircraft dropped RBK-250 cluster bombs, each containing 30 PTAB 2.5M submunitions, on the town of Ruisi in the Kareli district of Georgia on August 12, 2008. On the same day, a cluster strike in the center of the town of Gori killed at least eight civilians and injured dozens, Human Rights Watch said. In that press release and on its website HRW provided this picture as evidence identifying the weapon debris shown as a Russian RBK-250 clusterbomb. 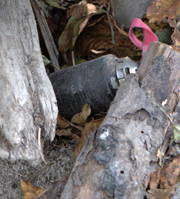 But a zoomed picture of the "bomb" shows that the fins of this object are cambered. Cambered fins are typical for tube launched missiles. While in the tube the missile the fins are snugged around the missile body. When leaving the tube the spring loaded fins snap into their flight position but keep their original curved surface. In contrast to that air dropped 'dumb' bombs like the RBK-250 shown here have straight fixed fins. A Russian(?) blogger noticed as much yesterday. One wonders how HRW and Marc Garlasco, its senior military analyst quoted in the report, missed those obvious inconsistencies in their 'evidence' when making their accusations. 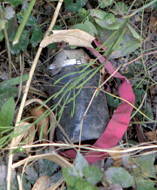 Human Rights Watch researchers saw and photographed unexploded submunitions from cluster munitions in and around the villages of Shindisi, in the Gori district of Georgia. Compare those to pictures from HRW's own June 2007 Cluster Ammunition Chart (pdf). In that HRW chart the object in the picture on the left is identified as M85 submunition as produced by various 'western' countries. 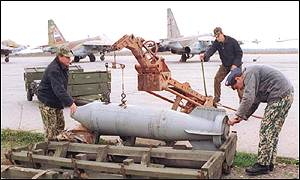 The bomblet in the picture on the right is identified as PTAB 2.5M, content of the Russian RBK-250 clusterbombs. It is obvious that the pictures from Georgia resemble the western submunition type. Pictures from the 2006 Lebanon war show (scroll down) similar M85 submunition dropped by Israel. Again one has to ask why HRW's senior military analyst Marc Garlasco miss-identifies these. The Georgian MoD released a press statement on Monday evening after Human Rights Watch (HRW) said on September 1 that in a letter sent to HRW, the Georgian side had admitted to using cluster bombs in the vicinity of Roki Tunnel, linking breakaway South Ossetia with Russia. “The Georgian armed forces have GRADLAR 160 multiple launch rocket systems and MK4 LAR 160 type (with M85 bomblets) rockets with a range of 45 kilometers,” the Georgian MoD said. The GRADLAR 160 is a product of the Israel Military Industry Ltd. It uses tube launched missiles with a diameter of 160mm and M85 submunition. Bonnie Docherty, arms division researcher at HRW said on September 1, that M85 cluster munitions were discovered in Shindisi, a village outside breakaway South Ossetia, north of the town of Gori. Docherty said that while this could point to Russian use, Moscow was not known to have that particular make in its arsenal. She added that it was possible that the M85 munitions had been scattered about, having been hit in a Russian strike. It is also possible, and much more likely, that Georgian troops fired their cluster-ammunition rockets against advancing Russian troops in Shindisi, i.e. on Georgian native ground, hitting their own population. A Russian strike on a Georgian GRADLAR launcher would certainly not have 'scattered' such ammunition intact. Why isn't HRW considering the alternative explanation? Human Rights Watch said it welcomed Georgia’s willingness to acknowledge its use of cluster munitions and expressed hope that this was a first step toward adopting the treaty. 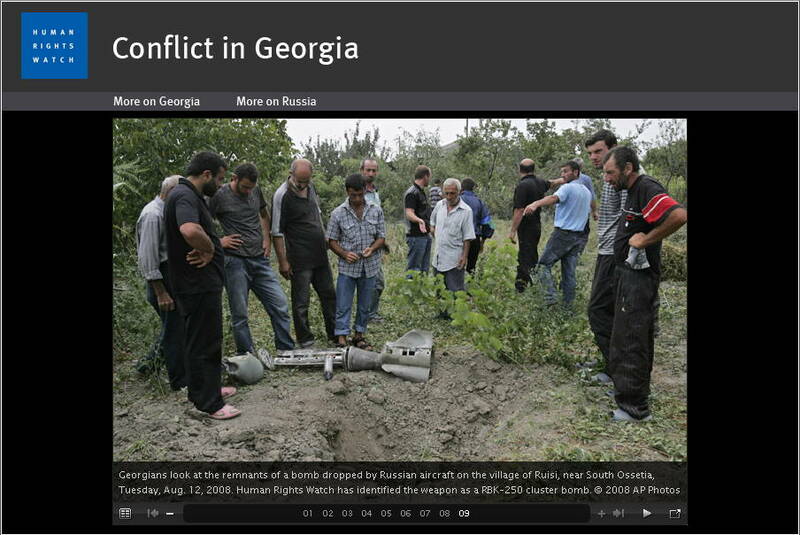 In August, Human Rights Watch documented Russia’s use of several types of cluster munitions, both air- and ground-launched, in a number of locations in Georgia’s Gori district, causing 11 civilian deaths and wounding dozens more (http://hrw.org/english/docs/2008/08/20/georgi19660.htm). Russia continues to deny using cluster munitions. “Russia has yet to own up to using cluster munitions and the resulting civilian casualties,” said Garlasco. But all HRW 'documented' in its earlier reports was misidentified debris and submunition. On what basis then is Marc Garlasco again making these accusations when the only proof for them are the August 15 and August 21 HRW reports which mistakenly identify Israeli made rockets and submunitions as Russian? Add an 's' to civilian and strike the word 'casualties' and the sentence is more near to the truth than what Garlasco implied. If Human Rights Watch wants to achieve a somewhat believable, neutral position in conflicts, it would be well advised to distance itself from a 'senior military analyst' that is not able to distinguish 160 mm tube launched rockets from 325 mm airdrop bombs and uses such false 'evidence' for partisan accusation. Before coming to HRW, Marc spent seven years in the Pentagon as a senior intelligence analyst covering Iraq. His last position there was chief of high-value targeting during the Iraq War in 2003. Marc was on the Operation Desert Fox (Iraq) Battle Damage Assessment team in 1998, led a Pentagon Battle Damage Assessment team to Kosovo in 1999, and recommended thousands of aimpoints on hundreds of targets during operations in Iraq and Serbia. He also participated in over 50 interrogations as a subject matter expert. In its August 15 and 21 press releases HRW accused Russia of using cluster ammunition in Shindisi near Gori in Georgia. In the September 1 press release HRW admits that the submunitions found there was not Russian, but 'western' M85 submunition as used by the Georgian army. But as this current screenshot of the HRW homepage shows, it is still accusing Russia and it is still distributing the obviously false 'evidence' to make that case. When will HRW stop doing so? Great investigative work, b. You've documented the lies for the historians. Probably the best we can hope for. Sure, some people did - Hijacking Human Rights - but it is still necessary to point out when HRW makes such huge flase claims based on falsified 'evidence'. It is one thing to know they are payed pipers and another to prove that they pipe a false tune. HRW is (partly) funded by George Soros as was the "Rose revolution" in Georgia. It is obvious they would take sides. Still it might be helpful to point out how they do so. A brochure by the Israeli Military Industry shows the type of weapon. B- excellent basic research you've done. Thanks so much. (Maybe Garlasco and his superiors could have done something similar-- including, checking HRW's own cluster munitions chart!-- before they rushed to public judgment against the Russians on this. I've blogged that this looks like HRW's very own "Kuwaiti incubator story"-- and reveals a lot of flaws in their methodology & SOPs. It's not just Garlasco. It's also the fact that the organization accepted his "research" and his very far fro,m acceptable level of "documentation" so readily and rushed so hastily to publish it. @d - likely not much to that story. While De Telegraaf has some good intel connections, it also usually exaggerating (major bombing campaign by UAVs?) the Arms Contol Wonk has a thread on that with some decent comments. HRW has been an agent of American and European imperialism since the days when it was Helsinki Watch and concentrated almost exclusively on highlighting abuses (many of which of course were real) of the Eastern Bloc countries and the Soviet Union. Nothing surprising here, though I'm not criticizing Bernhard's efforts to show that "they pipe a false tune." b, what would we do w/out you! Readers may recall that Marc Garlasco also came out with a very convenient quote regarding the Johns Hopkins Iraq mortality survey which appeared in WaPo and was widely published elsewhere - "These numbers seem to be inflated." Problem was, Garlasco hadn't actually read the survey, and even if he had his ability to comprehend its methods and conclusions was about zero. Garlasco later recanted - "I haven't read it. I haven't seen it. I don't know anything about it, so I shouldn't comment on it. . . . Like any good journalist, he got me to." Needless to say, Garlasco's regrets received nowhere near the degree of coverage that his original smear did. It's a shame because HRW's mandate is an important one, but until they sack Garlasco I'd suggest everyone takes their reports with with a very large pinch of salt. He simply can't be trusted. That is a real shame, that another ostensibly non-partisan organization has been so thoroughly corrupted and discredited. I'm certain that propaganda was not its original brief. human rights watch - does not watch - indeed on the middle east & latin america it has been blind. completely blind. How many cluster bombs were used on the 'thousands of aimpoints' that Mr. Garlasco identified? A fine job of reporting, B! It seems odd that someone formerly employed by the Pentagon might make a mistake about some munitions he should be familiar with. This goes along with the campaign of disinformation in the US media, which portrays Russia as the attacker in his conflict. I suspect this guy is a plant by the DoD or CIA. You can't trust governments, you can't trust NGOs. What is this world coming to?! Every few months, Nini Gogiberidze is deployed abroad to teach democracy activists how to agitate for change against their autocratic governments, going everywhere from Eastern Europe to train Belarusians to Turkey to coach Iranians. Gogiberidze is among Georgia's "velvet" revolutionaries, a group of Western and local activists who make up a robust pro-democracy corps in this Caucasus country -- so much of it funded by American philanthropist George Soros that one analyst calls the nation Sorosistan. In Georgia, the Soros-funded activists occupy a low-key three-story office building called the Open Society Institute of Georgia here in Tbilisi, the capital. An alphabet soup of international and local groups also makes its home there. Locals call it the "Soros Fund" building. Like Saakashvili, who studied law at Columbia University, many of the velvet revolutionaries spent time abroad. Gogiberidze studied for two years at the London School of Economics. And she unflinchingly answers sensitive questions about her employer, the Center for Applied Nonviolent Action and Strategies, or Canvas. The group is funded in part by the International Republican Institute, which many describe as the international arm of the GOP, and Washington-based Freedom House, which receives most of its funding from the U.S. government. Saakashvili was the poster child of the velvet revolutionaries, and when he came to power in 2004, he brought with him many of the leaders of Georgia's "civil society" movement. Soros even helped finance the broke government after he took over. Last November, Saakashvili cracked down violently on anti-government protesters and opposition media. Gogiberidze stayed up until 6:30 some mornings editing video that chronicled Russia's alleged abuses. A possible source of the HRW pictures? Thanks for the armscontrolwonk link, b. I agree. Most excellent post, as well. Where do you find the time? Gori is a militarized city holding one of Georgia's forward bases that was used to launch attacks upon South Ossetia. Russian counter attack was focused on dismantling Georgia's military infrastructure, including weapon stockpiles held in Gori. It is therefore quite possible that aerial bombardment of weapons cashes in the city and nearby military base could have "scattered" remnant parts of these munition far from their original locations in the resulting chain reaction of munitions explosions. That of course does not excuse HRW from this deliberate hoax. I would like to see you not discredit yourself by making assumptions that take away from the excellent investigation you have conducted. This uncovers the stockpiling of weaponry that was banned by more then 100 countries intended for use upon the populations of South Ossetia or Abkhazia, not the shelling of Gori using cluster munition by Georgia's own military. "Posted by: Dan | Sep 3, 2008 10:52:16 PM"
That's a pathetic misinformation attempt, israeli. It's pretty obvious when looking at where the munitions lie, what the context is of their being in that spot. A hit on a amo dump or a launcher doesn't cause the munitions it contained to fly 1000s of metres away. They remain close by and even an israeli can tell if they are of that source or not. lol I am by no way an "Israeli." to quote you: "It's pretty obvious when looking at where the munitions lie, what the context is of their being in that spot. A hit on a amo dump or a launcher doesn't cause the munitions it contained to fly 1000s of metres away. They remain close by and even an israeli can tell if they are of that source or not." What I'm pointing out is that all of us are trying to analyze two pictures as the only evidence of who dropped these bombs...the analysis given is excellent, as I've already pointed out, as to the origin of the maker of these munition...how they came to rest where they were found will forever be a matter of debate when none of us is 1) a specialist in the field of debris and explosive blast patterns nor 2) was present at the time of the bombing/shelling. I also never denied that these were Israeli made cluster bombs, just the fact of whether or not Georgian soldiers shelled Georgian civilians in an attempt to kill Russian invaders. Please educate yourself more in the matter before simply claiming someone an "Israeli" propagandist. FYI Dan, our host resides in Hamburg, not North America. Having seen my bit of ordnance explosions I am quite confident in claiming that the bomblets pictured were not `scattered' by anything but the usual means, the rockets in regular flight. A bomb on a launcher or a destruction explosion on a storage would not leave these as intact as they are. We may just disagree then. I find it rather hard to believe, actually, that a MK4 LAR 160 type rocket, which carries 49 or 63 bomblets and has a failure rate of as high as 2.3%, that was destroyed due to aerial bombardment would not have the statistical chance of leaving a certain percentage of its bomblets intact. We've seen pictures of only two (2) bomblets, not hundreds or even tens...two. My apologies for inaccurately stating your location, but the point was without an investigative team of our own on the ground in and around Gori, the only part of this investigation that is verifiable is visual identification of these weapons as Israeli made (due to other pictures that show similarities) and not how they got there. From Hamburg, the United States or anywhere else other than Gori for that matter, this claim of how the bomblets got where they were found is and always will be an assumption until proof can be gathered from the ground. HRW is now, somewhat backtracking. Quote: It occurs to me that one explanation for what HRW's witnesses in the Gori area saw is that the Russian aircraft might have blown up some of Georgia's cluster bombs stockpiled in the area.. In HRW's August 21 statement, and in the latest "Clarification", the eye-witnesses to the attacks are quoted as saying that "Russian air strikes on Georgian armored units located near Shindisi and Pkhvenisi were followed by extensive cluster munition strikes that killed at least one civilian and injured another in Shindisi." Would this description not be consonant with (a) the Russians having bombed ground targets in these areas-- hopefully only legitimate military targets, and then (b) some of those strikes, hitting units equipped with cluster bombs, had caused secondary explosion of those cluster bomb munitions? Considering Russian use of thermobaric weapons during the hostage-taking in Beslan, I'm a little confused over what this "discovery" is supposed to signify? That Putin is a better dictator than Saakashvili? @Mycos - the Weekly Standard is toilet paper, not a source of information. the Weekly Standard is toilet paper, not a source of information. i disagree b, i find it is an excellent source for discovering what lies the neocons want the masses to focus on. sometimes it is the first place you hear the reality reconstruction of a certain event. they make history there! a bold assumption.....the point was without an investigative team of our own on the ground in and around Gori, the only part of this investigation that is verifiable.....It would appear that the situation isn't nearly as simple or clear-cut as is being presented to us in the mainstream media.....this claim of how the bomblets got where they were found is and always will be an assumption until proof can be gathered from the ground. b, i always know you're on to something by the verbage of the pushback. I have posted a follow up to the above here. Marc Garlasco, senior military analyst I don’t get what is the problem with Russian cluster munitions attacks. Just yesterday Belgian soldier died from Israeli cluster bomb and why you hypocrites don’t check Serbia for Depleted uranium and cluster ( yellow ) bomb left 9 years after NATO bombing and complain about that ?? According NATO apologist Depleted uranium is not harmful and it could be stored in your garden…Right?